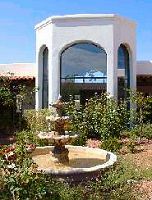 Arizona Bed and Breakfast, the Casa de San Pedro in Hereford AZ. Region: SE Arizona, between Bisbee and Sierra Vista. 90m SE of Tucson. 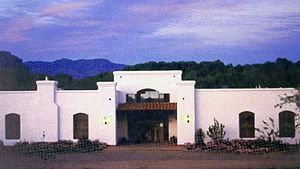 A territorial hacienda located on 10 acres adjacent to the San Pedro River and Riparian Conservation Reserve at 4250' elevation for comfortable year-round climate. Offering 10 guest rooms with private Mexican tiled baths. Built around an interior courtyard with fountain, flowers and birds! Furnished throughout with Mexican hardwood furniture for an authentic SW adventure. Ideal location for birding, hiking, biking or just relaxing. Located near all of SE Arizona's birding hotspots and historical sites: Ramsey Canyon, Katrchner Cavern, Patagonia, Whitewater Draw, Tombstone, Bisbee, Cochise Stronghold. Gourmet breakfasts dialy, afternoon home baked pies, cakes and other sweets. Rates: $109 - $145. Visa, MasterCard, Discover, American Express.